I take issue with the longstanding adage (or is it proverb or aphorism or just a saying?) 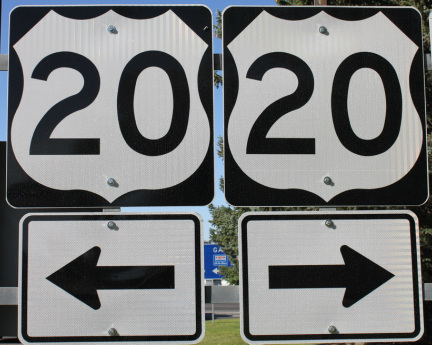 of the supposition that "hindsight is always 20/20"; that is, that one invariably can reflect on or deflect criticism from past events or actions by assessing their unintended consequences in the context of when they occurred on their effects on the present--the "if-I-knew-then-what-I-know-now" defense, lament, reasoning, or excuse. I maintain that, at best, there's a 50-50 chance hindsight is in fact 20/20. In the first place, in the present you must be focusing on that past experience with clarity of view on the incident or series of events you've set your hindsights on. Right there, there is a 50-50 chance: either you are or you are not looking clearly into the rear view mirror of memory. Secondly, and equally as important, you would have had to be in a clear state of mind at the time said incident or series of events took place to be able to recall it in the present to properly reflect back on it/them. Again, a 50-50 chance. The point is, if one has a clear view of a blurred image, it's blurry. Conversely, if one has a blurry view of a clear picture, it's still a blurry picture. Period. So, the odds are really only 1 in 4 that hindsight is 20/20--call it hindquartersight. A simple chart borrowed from Gregor Mendel's genetics theory regarding dominant and recessive genes, below, shows this relationship. And it points out that it is just as likely one would always have 20/20 hindsight as being fuzzy about something already blurry; in which case and in that light, one could be deemed either, legally, morally, or ethically blind or as having perfect hindered hindsight. Therefore, I submit that if both the "then view" and the "now view" are clear and true, then hindsight may truly be, as the saying goes and as demonstrated above, 20/20. But the odds are there is a 75% chance that this is not the case. And all this isn't factoring into the picture the potentially obfuscating or refractive elements of natural memory loss, unconscious selective memory, and conscious selective memory gain (a.k.a. embellishment). And just because someone has 20/20 hindsight, lest we not forget that they can still be short-sighted, long-winded, biased, and/or manipulative in interpreting its relative or actual significance to the point at hand. Thus, with all the variables and permutations of this hindsightedness theorem, if the odds are really long--say one chance in 57--it might be called "Heinz-sight" or perhaps it follows, "condimentia." And does one's mind’s eye have hindsightedness, be it 20/20 or near- or far-sighted or, as a rock band has lain claim to, hind-blindness? Maybe it's a one-in-three chance? The point of analyzing all this is to claim the disclaimer that the content of this website is meant to be as honest and accurate an account as I can make with respect to the facts contained on it and to the best of my ability to recall the events and to transcribe and then interpret the graffiti logged and documented herein. as back east, so out west..."